In the last issue (#89) we discussed the obstacle: Lack of Required Approvals from Stakeholders. In this issue we will explore another obstacle: Unproductive Assets. 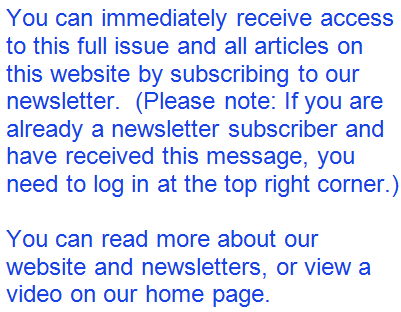 We've finally reached the last obstacle with an entire newsletter article dedicated to it. And here's some good news, addressing this obstacle can put money in your pocket in the short term, before you even sell your business! Look around your facility. Identify unproductive assets and sell them, donate them or trash them - before you put your business on the market. Unproductive assets are things like obsolete or excess inventory, furniture, fixtures, machinery and/or equipment. Those obsolete items are obstacles, literally. In many businesses they are taking up a lot of space in the office or warehouse. Employees may need to take circuitous routes within the premises to get around them. Perhaps more importantly, they are cluttering up the appearance of your business. Among the first suggestions made by residential real estate agents is to eliminate the clutter. The same holds true for your business. Although appearance is usually not a major factor in a prospective buyer's decision, it can affect the first impression of your business. And we all know "First impressions are lasting impressions." In Issue #57 we previously explained businesses are valued based on seller's discretionary earnings (SDE). If the business is profitable, usually the SDE value exceeds the value of assets being transferred. So, in essence, you are not being paid for the assets, you are being paid for the cash flow created by productive assets. If you transfer excess or obsolete assets, the prospective buyer is not going to pay you any more than if you don't include them in the sale. You need to transfer to the buyer the assets that are creating your cash flow, but you do not need to transfer unproductive assets that do not create cash flow. This creates an opportunity to put a few dollars in your pocket while you eliminate the clutter in your business. You can sell your obsolete or excess inventory, furniture, machinery and equipment and clean up the clutter at the same time! But, do it before you put the business on the market. If you do it after it's on the market, buyers may think you are trying to pull a fast one. For sellers who do not fully understand the concept of their business valuation being based on SDE, not the value of assets transferred, this can create a mental obstacle. Often, sellers want to add the value of inventory or equipment to the price offered by a buyer. But that is not the way it works. Again, the buyer is acquiring the cash flow generated by the business and is entitled to receive the productive assets that create that cash flow. But, you do not have to transfer unproductive assets that are not responsible for creating cash flow. Returning to first impressions, often the unproductive assets are not only taking up space and creating clutter, but also accumulating dust and dirt. It's a lot easier to have the appearance of a clean facility when those obsolete or excess assets have been physically removed. In fact, if you don't do it prior to putting the business on the market, some buyers will make it your responsibility to remove the unproductive assets prior to closing. They don't want to deal with it. There's another reason obsolete inventory is an obstacle. Buyers may become overly concerned about the nature of the business results if levels of obsolete inventory that are too high. Because you have many more years of experience in the business than they do, they may project that their obsolete inventory problem is likely to be much larger than your problem, and factor that negative aspect into their evaluation of your business.